While plenty of Bluetooth speakers exist on the market, the whole setup and pairing thing can be bit of a hassle, specially when you have more than one set of phones (among a party) who all want to play their music. Olixar have a clever solution to answer that, their Drop&Play speaker. Needing no wires, no pairing, no Bluetooth and no Wifi, it just simply picks up sound from your phone’s speakers using induction and plays it back in a louder voice. Magic? Not really, but pretty close! A small rectangular cube of sorts is what this device really is. 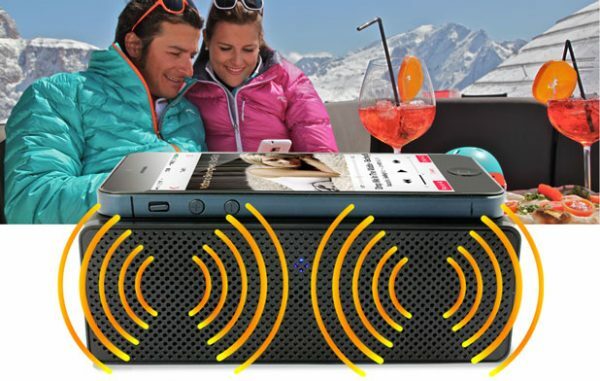 With a charging port on the back, a grill to tell you where the speakers are, and a label on top indicating where to put your phone is all there is to it. Extremely light and small, this can fit in most purses and hand bags. There is no real set up to this, as far as pairing goes. All you need to do is put your phone, speaker down, on top of the speaker marks on the device. The device picks up the sound and reproduces it. Easy peasy. Of course, if you have some of the modern phones, who have front facing speakers, you just have to face them downwards. The science is not that difficult, once you think about it. Sound is produced by waves, and induction is a process by which waves can get transmitted. Induction heaters work on the same principle, as do transformers that we see everywhere. The sound produced on your phone gets passed into the inducting amplifier and gets reproduced. I am speculating the science here, by the way, but this is how my brain explained it to me. So the real test is the sound quality. While you are not going to get high bit rates, and there will be some loss, the sound was amazingly good for something that works on induction, and is frankly so cheap and small. Yeah, you won’t be having parties with this, but if you want to listen to your music loudly, or even have phone calls on a louder speaker than your phone’s, this is the device! It retails for only £10. This one lies somewhere between novelty to being really cool and awesome!